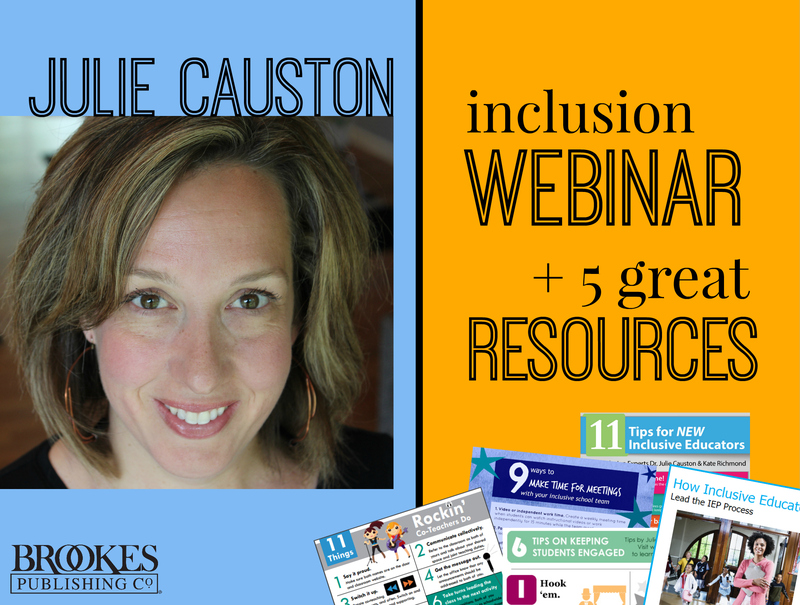 Engaging All Learners: Webinar Signup & 5 Great Resources from Julie Causton! Have you stopped by our new community over at edWeb yet? Brookes just created a brand-new learning community called Teaching All Students: Practical Strategies for Inclusive Classrooms, and it’s definitely worth joining. You can participate in online discussions with peers, get invitations to upcoming webinars, view webinar recordings, receive a CE certificate for a past webinar, and access more resources on teaching and fully including all learners. Sign up for the Engaging All Learners webinar today; it’s sure to be a dynamic and valuable learning experience. Registration is open now! What should you do a month before an IEP meeting, the day of the meeting, and after the meeting? 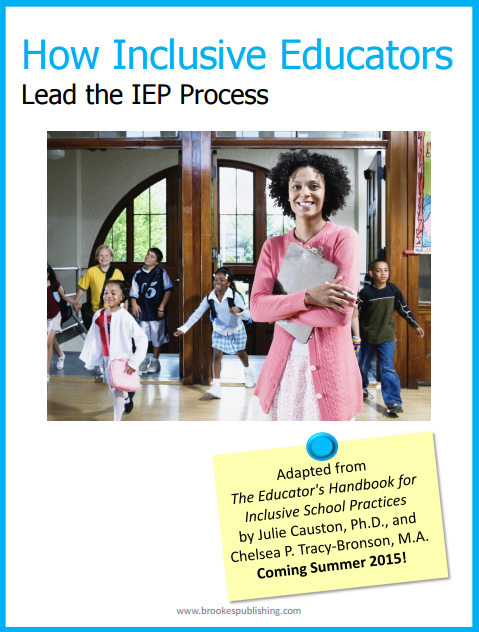 Find fast answers in this booklet of quick tips, adapted from Julie’s newest book with Chelsea Tracy-Bronson, The Educator’s Handbook for Inclusive School Practices. You can download the other posters here. 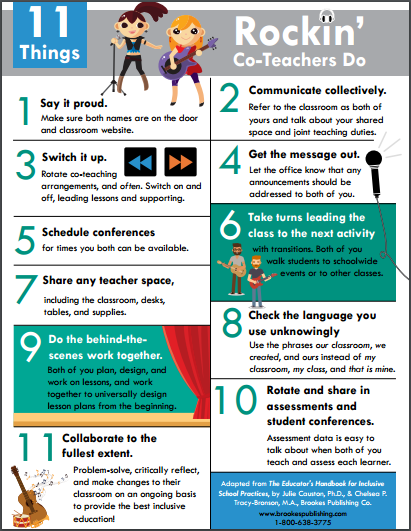 11 Things Rockin’ Co-Teachers Do. Are you in a co-teaching partnership–or preparing to partner up in the future? 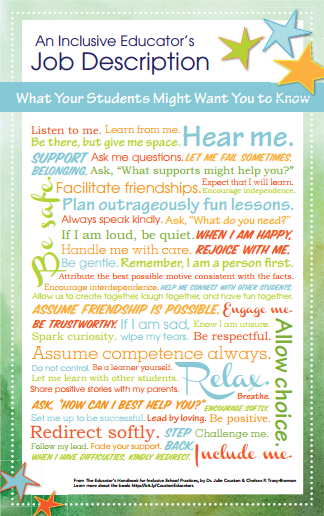 Keep this infographic on hand as a fun reminder of the essentials of effective team teaching. Teamwork is an everyday success factor for inclusive schools. As Julie emphasizes, great principals develop teams of specialists and generalists to put their vision of full inclusion into practice, and they work hard to build time for collaboration into the school day. 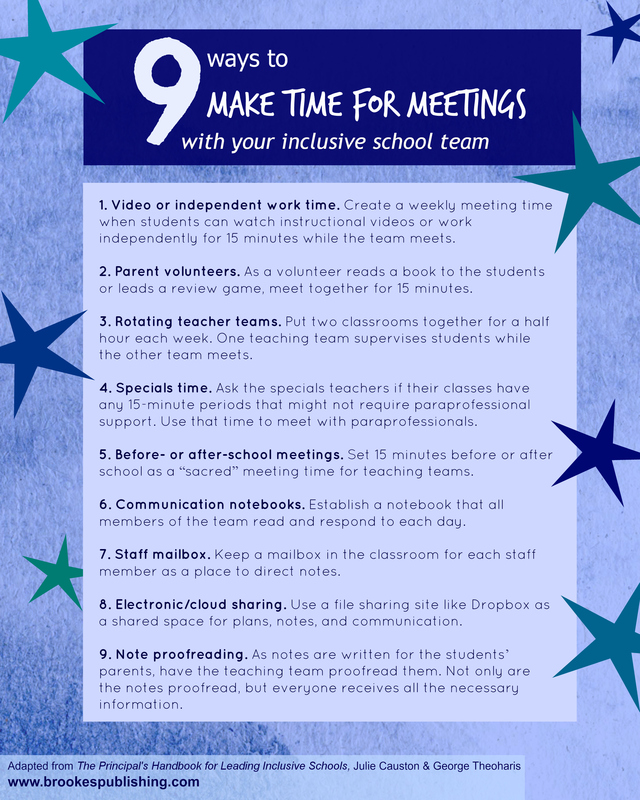 Here are 9 tips on making time for meetings with your inclusive school team, adapted from Julie’s book with George Theoharis, The Principal’s Handbook for Leading Inclusive Schools. Read the full post for 3 more things principals of effective schools do. Want more from Julie Causton? We offer Julie’s books as a convenient bundle or separately; go here to learn more about each book in the series. Julie’s offering a fantastic online course called “21 Days to Happier and More Engaged Learners.” Her course co-creators are Dr. Kristie Pretti-Frontczak and Kate MacLeod–together, they have a collective 45 years of experience teaching in classrooms and supporting educators, so this is sure to be an incredible professional development opportunity. Opening day is April 15; learn more about it here. Be sure to sign up for Julie’s webinar before April 14th!